The controversial commander-in-chief has helped make Twitter the go-to platform for breaking news, but his appeal can work both ways. 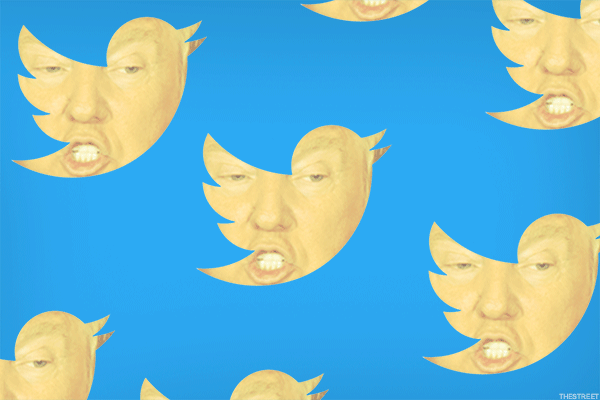 For better or worse, it's been the year of The Donald for Twitter Inc. (TWTR - Get Report) . After struggling to attract new users following its 2013 initial public offering, the San Francisco-based social media company has found new life since Donald Trump was elected president on Nov. 8, 2016. Twitter posted a 14% increase in daily active users for the third quarter, its fourth-consecutive quarter with double-digit growth. And though many factors have worked to expand Twitter's reach, Trump's active use of the platform -- he's sent more than 36,000 tweets and has over 42 million followers -- is undeniably an important one. "Twitter is super relevant right now in our society, and that's largely because of Trump," said Matt Britton, CEO of Crowdtap, a New York-based digital and social media marketing agency. "Twitter is where news is -- it has given them a chance to reinvent themselves as a place where news is broken, and because of that they've seen a resurgence." Twitter's stock, which tumbled through 2015 and into 2016 amid declining advertising revenue and a series of management blunders, has gained a formidable 22% in 2017, slightly behind the Nasdaq's gain, but ahead of the S&P 500's. To be sure, Twitter has had to answer to the problem of harassment on its service as well as the ease with which foreign entities have been able to spread disinformation. And spam and suspicious accounts remain a problem. President Trump has been a prolific and unpredictable presence on Twitter. Yet despite long-standing struggles to compete with Facebook Inc. (FB - Get Report) and Alphabet Inc.'s (GOOGL - Get Report) Google for digital advertising, Twitter is seeing some improvement in video ad-sales though it has yet to make much of a dent compared to its larger rivals. Trump's election coincided with the December launch of Twitter Live, which was powered by Periscope, the live-streaming startup it acquired in March 2015. Twitter also debuted its Moments tab, which serves as a crowd-sourced wire service, at the same time. As a Republican presidential candidate, the former reality TV star made use of Twitter in new and important ways, using the 140-character message board to actively communicate to his millions of supporters, all the while boasting that he was bypassing a "mainstream media" out of touch with America. The president, and his tweets, are often referenced in Twitter's Moments. "Twitter Moments is really like the new front page," Britton said. "It might be the future of storytelling in media. If I were Twitter, I would be about owning news." On Nov. 2, however, Twitter was dealt a public relations blow when the president's Twitter page, the ubiquitous @realDonaldTrump, suddenly went dark. Initially, Twitter said it was the work of an employee on their last day in the office, though The New York Times reported on Nov. 3 that the person who deleted Trump's Twitter account was actually a contractor. My Twitter account was taken down for 11 minutes by a rogue employee. I guess the word must finally be getting out-and having an impact. While Trump's heavily-monitored page was deleted for just 11 minutes, it was enough to prompt larger questions about internet security given recent attention in Washington to Russia's aggressive use of Facebook and other platforms to influence U.S. elections and political debate. That a non-employee contractor could take down the president's page only heightened concerns -- after all, what might have happened if that same employee had posted word of a foreign attack in a U.S. city, or called for attacking a rival politician? Twitter said it would take steps to ensure such an incident won't happen again. Regardless of who did what, the disappearance of Trump's Twitter account underscored the platform's prominence as a news source, especially for breaking news. The Oct. 31 terrorist attack on New York City's West side that left eight people dead, was the latest high-profile example of Twitter's Moments page serving as a rapid-fire news source. But Twitter's appeal can work both ways. As anyone who frequents the platform can attest, conversations can get nasty very quickly (CNN has dutifully cataloged all of Trump's here.) While the president's supporters may view his tweets as an asset, advertisers might see the site as an unsafe place to market their brand. "It's not the president personally, but more that while news used to be a very neutral place for brands to advertise, nowadays some of the news can be polarizing," Beena Kalaiya, head of social at Mindshare North America, a media agency owned by GroupM. "So you do have to be more careful if you don't want to tie your brand to run within, or next to, something controversial." Trump, of course, has never shied from controversy. Which may not be such a bad thing for Twitter as it seeks to gain traction in a social media world where Facebook is the 800-pound gorilla. Under Jack Dorsey, the co-founder who returned as CEO in Oct. 2015, Twitter has been emphasizing live video. And although the platform lost the rights to stream Thursday Night NFL games this season to Amazon.com Inc. (AMZN - Get Report) , Twitter did launch a new, 30-minute live show called #NFLBlitz, as well as NFL Media's Fantasy Gameday on Sunday mornings. Trump's inauguration was also streamed on Twitter Live, easily making it the platform's highest-viewed event. As Trump nears his first full year in office, he remains a focal point on Twitter's platform, for better or worse. Alphabet and Facebook are holdings in Jim Cramer's Action Alerts PLUS Charitable Trust Portfolio. Want to be alerted before Cramer buys or sells GOOGL or FB? Learn more now.